When we interviewed Marie Klopf of the Ann Arbor Art Center, we were pleasantly surprised to find a woman who solved the “work-life balance” dilemma. Her solution? Forget balance; think sustainability. Read on to find out how she built both a sustainable life and a sustainable nonprofit, the trial-and-error process of navigating ambition, motherhood, marriage, and the lessons she learned along the way. When I started at the Ann Arbor Art Center, I was humbled by how much I didn’t know and how much I needed to learn in order to successfully lead such a wonderful and deserving organization. It was through the process of learning that the real magic of expanding the Art Center unfolded. The challenge before me reminded me of my first finance class in college. I thought it was going to be easy. I was smart. I felt like I could do it. Sadly, on the first test, I scored the lowest grade in the class. I was mortified. I met with the professor to learn what I needed to do. And then with great pride, on the second test, I scored the highest grade in the class. My experience throughout my personal life and professional career has followed a similar path. When I look back, I can see that this is who I’ve been all my life — willing to dive in, willing to learn — able to pivot if things didn’t go the way I thought they would. And if there was one thing I’d want any woman to know, it’s this: be willing dive in and get it wrong, learn valuable lessons, and ultimately be comfortable with the concept of “failing forward” as a true measure of success. One of my favorite lines was Cokie Roberts’ response to the question “Can women really have it all?” She said, “Yes, women can have it all, just not all at once.” I wish I would have heard and understood this when I was younger; maybe then I would have been more patient while I was learning to navigate motherhood, career, and marriage. I was an engineer for GM and left after I had my second baby. Back then you had to choose: you could either be a stay-at-home mother or a career woman. I struggled with this decision because the truth was, I was both. I’m sure on my tombstone it will say, “She never really found balance;” she continued to try and do it all – all at once. In my heart, I knew that if I became a stay-at-home mother, both my children and I would have been unhappy. I’m of the firm opinion that the biggest thing we can do for our children is to chase our dreams; that’s how they learn to chase theirs. We are all unique individuals and we can embrace our uniqueness, without apologies, and be true to who we are. A lesson learned. After my second child was born, I stayed at home for a while until one of the suppliers I worked with asked me if I’d consider joining their sales team. I took the job — part time, 3 days a week, for eight years — and loved it. Women, collectively, must fight against stereotypes that tell us who we should and shouldn’t be. Find out who you are, and courageously live your life accordingly. After my children were in school, I went back to work full-time in the chemical industry and began traveling extensively for work. I was away from home often which became problematic, especially as my children were becoming teenagers. So, I jumped off that speeding train and I took a job with a startup in Flint, Michigan which was closer to home. Sadly, my marriage became a casualty of my “lack of balance” during this tumultuous time in my life. Pressing forward and needing greater flexibility both with my career and with my family, I ventured out on my own and started a consulting company that specialized in Purchasing and Supply Chain Management. Building a consulting practice was wonderful, profitable, and afforded me tremendous flexibility. But true to my nature, with the business booming, my life tipped out of balance as I began working excessive hours — clearly a pattern throughout my career. I am energized when my work positively impacts the success of organizations and the people who work for them. The practice grew and I eventually I took on a partner in the firm. After several years, and after my children graduated and moved away, I yearned for a new challenge. Luckily, I had saved enough money so that I could take time off to explore new opportunities, which is exactly what I decided to do — I took a 6-month sabbatical. About 3 months into my sabbatical, I was contacted by a colleague about the Ann Arbor Art Center’s search for a new President/CEO. The current CEO of 34 years was planning to retire. I was asked if I would consider a 6-month interim role while they conducted a formal search. I said yes. Almost immediately upon accepting the interim role, I became enchanted with the Ann Arbor Art Center and its rich 108-year history. I threw my name into the hat and, with great excitement, became the full-time leader of the organization. Leading the organization, not being from Ann Arbor, and having no formal training or background in art, was both thrilling and terrifying at the same time. Initially there were significant infrastructure challenges, including phones that didn’t work, outdated software, poorly-documented policies and procedures, etc. It was very rewarding to focus on building an amazing team and just “fixing” things. Our next challenge was to develop programming that integrated both art and technology. In the spirit of STEAM (Science, Technology, Engineering, Art, and Mathematics), we developed and launched the Roseann Hebeler Brown Art Reach Technology Lab (ARTlab), which offers a full suite of classes that combine fine art and technology. Stop-Motion Animation and Graphic Novel Academy are two signature classes that are available in our ARTLab education program. By 2014, the Art Center was thriving and unable to keep up with the community’s demand for visual art experiences. We were out of space. After extensive research and a great deal of luck, the Art Center had the opportunity to purchase the building next door – our dream of expansion came true. Non-profit arts and culture organizations remain vulnerable to economic cycles. In good times, we thrive. In bad times, we struggle and often experience set-backs that take years to fully recover from. With this new space will come a new business model — one that can both thrive and survive as the economy naturally cycles. Currently the Art Center earns 75-80% of its income. Some people look and say, “Wow, that’s awesome!” and others think, “You need to do a better job of fundraising.” Both are true. We’re focused on answering the question: How do we best serve the community and achieve sustainability with a business model that endures for our next 100 years of visual art presentation in downtown Ann Arbor? The answer to this question is a work in progress; stay tuned! What we loved most about our interview with Marie is how transparent she was about the reality of “balance.” While she claims she never found it, we can see that she found her way to be in balance with who she really is, rather than who the world thought she needed to be. She also found a way for the Ann Arbor Art Center to be in balance with the current economic realities facing nonprofits. Is sustainability the new balance? We certainly think it is. 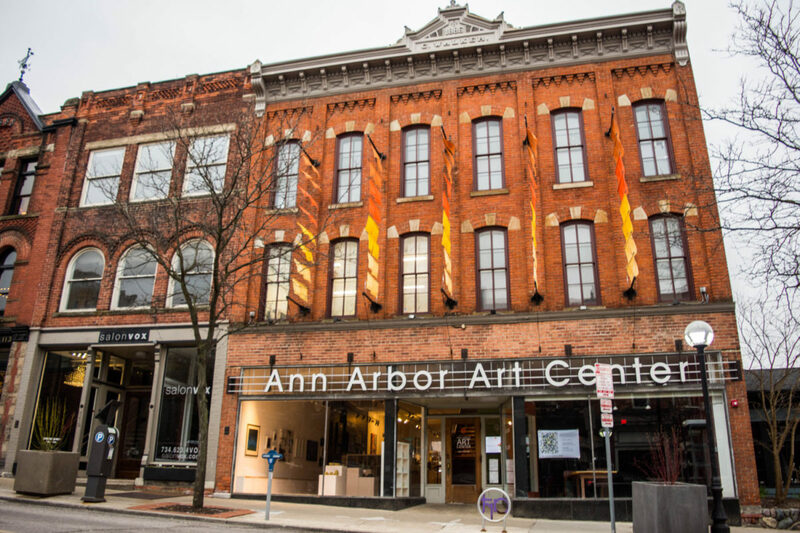 If you’re curious about supporting the Ann Arbor Art Center, checking out an event, taking a class, or going to see their exhibitions — there are a lot of ways to get involved that fits your passion. And of course, there’s always writing the Art Center a big check!